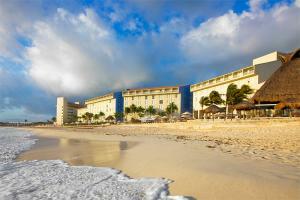 This beautiful, recently renovated resort lies along an unspoiled beach. Each of the 379 bright and airy guest rooms feature inviting contemporary decor, the signature Heavenly Bed®, and stunning Caribbean Sea or lagoon views. At night, sample a variety of gourmet specialties or enjoy stunning sunsets. Royal Beach Club: Exclusive services, private pool, daily continental breakfast and afternoon cocktails with hors d'oeuvres. Close to numerous recreational and cultural areas including Xcaret, Xel Ha and the ancient ruins of the Mayan Empire, 9 miles from the airport. Arrecifes, El Palmar, Sunrise Bar & Grill, Sunset Bar & Grill, and In-Room Dining.